This report confirms the overall excitement and growth that the domain industry enjoys. I believe we still have a huge upside. I’d like address each one here. Regarding SEO, domains are one parameter used in search. It’s a good idea to have keywords to match what you do in your domain(s). Based on good research I’ve seen the ending (top level domain) doesn’t matter that much. Regarding client success, it’s generally agreed that using an established top level domain is best. Regardless of the ending, the key is to get a domain that is clearly memorable. 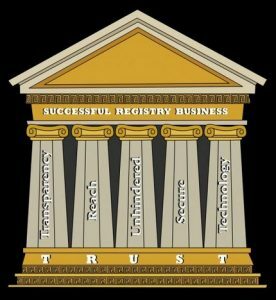 Regarding registry success, almost all registries are going to succeed. Long term success was baked into the application process. If they don’t succeed financially on their own, they are set up to be easily rolled up and consolidated with a conglomerated registry like Donuts or Afilias. The main point however is that we all have something to be excited about. The domain industry remains relevant and continues to grow as fast or faster than many other industries. Congrats to Donuts on their success. Nic CL (.cl ccTLD) is a pioneer in the domain name space for South America. We interviewed Patricio Poblete, who has managed that ccTLD for almost 30 years now. Patricio sent one of the first emails from university to university in Chile. What challenges do they face and how did they overcome? Joe A: Good morning. How are you Patricio? Patricio P: Good Joe, how are you? Joe A: I’m doing well. Actually I’m having a little trouble with all kinds of technology in the last week, including my Skype this morning. Patricio P: And it’s not because it’s so early there, right? Joe A: Well, actually it’s not because it’s so early, well, it’s about 7 o’clock here, so are we on almost the same time? Patricio P: Well, it’s 11 here. Joe A: Oh it’s about 11. Okay, we’re not too far off. Thank you by the way for being kind enough to take a few minutes to talk to me. Patricio P: It’s a pleasure. Joe A: Yeah, I don’t know if you’ve heard about what I am doing, but I started a series of blog posts that I’m going to call Country Code People, and the whole idea is to basically I’m trying to interview Country Code Managers, ccTLD Managers from all around the world and I have already done a couple for a few of the fellows from Africa and now I’m sort of making my way through Latin America or wherever I can find people anyway. Patricio P: You did Costa Rica, I think. Joe A: I spoke to the girl from .GT, Guatemala. Patricio P: Oh yeah, that’s correct. Joe A: And so little by little I’m making my way through. Yeah, she’s very involved in the ccNSO. Patricio P: Yes, she’s very active. Joe A: And she’s just a sweet lady. I think I might have met her before, but I specifically noticed her in the Johannesburg’s meetings and so I called her and tried to get something arranged. Joe A: Okay, I think I’m pretty well set to start. Joe A: So, to start it, I’d like to say I’m interviewing Patricio Poblete. Patricio P: Oh, thank you. Joe A: Yes, and to get started. I guess I want to ask you a little bit about how you got involved in .cl and how you’ve got interested in the internet if I may? Patricio P: Well, our interest comes from a long time ago as you say. My first contact with networks and this was before actually the internet was in the early 80’s when I was doing my PhD at the University of Waterloo in Canada. So, there the university was connected to the world by UUCP and there was also the Usenet, so it was kind of the social network at the time. When I came back to Chile after getting my PhD and that was at the end of 1982. We started trying to find a way to connect ourselves to the world, and that started happening in around 1984, 1985, I was still done through UUCP, it was a protocol connecting UNIX machines. So, in 85, we sent what turned out to be the first email between two universities in Chile. Patricio P: Yeah, we did some the very first email. At the time we never thought that one day we would be swamped by emails. Patricio P: So, it was a rarity, and then a couple of years later in 1987, we got a way to connect to the world originally through our colleagues in France and later through UUNET with Rick Adams. Patricio P: So then we started exchanging emails and news on a daily basis and it wasn’t until 1992 that Chile was connected to the internet proper. By then we have been doing that for 5 years already. One of the first things that we found out back in 1987 was that to use some of the services like email for instance, we needed a domain name. Patricio P: So, we decided to register a domain name for our university, we were doing that as University of Researchers at the University of Chile, and we quickly found out that was no one in charge of managing the list of registered domain names for Chile, the .cl ending. So, we ended up having to do that ourselves and we took charged of that task. The IANA delegated .cl to us, and that was the beginning of what’s now called NIC Chile. We have been doing that ever since, always as one of the functions and one of the services that the University of Chile provides to the community. We are still a unit of the University of Chile. Joe A: Wow. So I always like to ask people like yourself that go so far back, did you actually meet with John Postel in that process? Patricio P: Only a couple of times and that was later down the road. Our contact at the beginning was more indirect through Rick Adams who was doing a great job at the time of helping people get on board. Patricio P: Yeah, we spoke to Rick and Rick took care of the details. Joe A: I see. Yeah I like to ask that because I’ve always heard the stories about John Pastel just basically trying to find people around the world to manage country code domain names. I was curious if that was kind of the situation with you guys. Joe A: So you sent one of the first emails from university to university. And I guess you’re still using what today would be kind of a very old technology I guess, although it’s probably still around. Patricio P: That email was sent through UUCP using dial up telephone lines. Patricio P: We had to actually borrow telephone lines to do that. In Chile at the time it was hard to get a new telephone line installed. So, we had to use what we had, but we were lucky that we were able to do so. Now, it was not inexpensive especially international calls. Patricio P: So, it was a blessing when a new kind of modem came up, it was called Teledict Trail Blazers that were incredibly fast, but for the standards of that time, right? Patricio P: But it was incredibly slow. Joe A: Oh yeah, yeah, of course by today’s standard. I mean actually I still consider it a miracle that I can have a very personal conversation, see your face online today, I mean it’s amazing what has been accomplished. So, all right then fast forwarding a little bit, just a little bit more about the NIC chile or nic.cl. Is it run like a company? You said that it’s part of the university, do you have employees or? Patricio P: It is part of the university. It is a self-contained unit within the university. It has, right now there are over 40 people working for NIC Chile. Patricio P: And it has, as I said I’ve been doing this job for 30 years now, but for most of the time it was simply one project within the Department of Computer Science. Patricio P: And it’s living recently like a month or so ago that the University approved it becoming a unit officially within the University’s structure, what they called Center. Patricio P: So that’s what we are now. Joe A: Well, that’s great. Patricio P: But that’s just a little thing in what we actually do, but we’re more formal now. Patricio P: But it is not a company, it is not. It is a part of the University. Joe A: Yeah, so it’s a university’s center, so that’s the good way to describe it. But obviously if you have that many people working on it, so it really says to me that Chile is a forerunner in the internet probably in all of Latin America, maybe .br they seem to have done quite well. But you seem to be one of the earliest to have really got online and got on board with the domain name system and the country codes, would that be true or is there another country that’s…? Patricio P: Certainly, we were one of the first and I think in terms of domain per capita, we rank very high in Latin America. There is a very high level of adoption of .cl in Chile, which would seem like a given, right? Patricio P: But that’s not the case in all the countries in the world, there are many countries were people tend to use more the generics, like the traditional ones like .com, .net, .org. or the newer ones. We were perhaps lucky in that system works, probably because we were here so early in the game when people in Chile started hearing about this new internet thing. Patricio P: We were there already, and a number of universities and some government services had already registered .cl names and we are using them, so some of the larger companies, so the community when they’ve started finding out that there was this internet, they started immediately seeing some addresses that ended with .com and that tend to be international or foreign and also other names ending in .cl that they were local. Patricio P: Domestic. So, kind of there was this association, if it’s Chilean its .cl. Patricio P: So, even to this day we have over 90% of the market so to speak in Chile. If you come to Chile, if you visit Santiago or the rest of the country, you’ll see that most of the domain names that you see being used are .cl domain names. Patricio P: That’s not to say that some important names are in other domains like for instance some of the larger newspapers use .com. Patricio P: Which is okay, they can, but they are kind of the exemption. Most people would tend to register .cl first, and some of these .coms they also have their corresponding.cl. So, that translates as I say into a large fraction of the domains being .cl and a large number of domains per capita for Chile. Joe A: Yeah, you are so ahead of what I was thinking, because I always like to ask what is the percent of .cl, and I have not to had the chance to visit Chile and I do hope I can visit there one day, there is a lot of places I want to go still, but I like when I drive in a different country. I’m always looking at the billboards to see are they using .com or are they using the country code. So, in your case you would say in Chile a lot more are using the .cl. Is there a percentage? Patricio P: As I say, well, it’s hard to come up with exact reliable numbers, but it seems to see over 90%. Joe A: Wow that is excellent. Okay, good. To me, go ahead. Patricio P: Yeah, perhaps one other decision that we made very early could have helped in this. We decided not to sub-divide the domain name’s space. Many of our colleagues did use a sub-division for instance you have com.ar for Argentina or edu.ar or in the UK you have co.uk, right? Patricio P: So for many countries internally they reproduced most of the structure of the generics at the time. But that kind of meant that if you were using a com-dot-your country, it was kind of a second-rate version of the real .com, right? Patricio P: While in our case since we did not subdivide and all the research where at the second level using the .cl was like putting that in an equal footing with the .com, right? Patricio P: That may have helped the public perception of the domains. Now, if you fast forward to the current day, many of the countries that use that subdivision have moving away from it and opening up the second level for registrations, okay? Which has been good for their income because they can sell domains there, there is a whole virgin territory to be explored. Joe A: You’ve already done that. How many .cl domains are there? Patricio P: As, oh there’s a little over half a million. Joe A: Oh it is? Patricio P: Or five-hundred thousand I think. Joe A: Yeah, that’s actually really, really good among ccTLDs and it sounds to me like you have a pretty good number of the businesses in Chile using that cl., so wow that’s excellent. And you are right a lot of the country codes are going now to release their second level domains. It is pretty interesting to see that. Well, obviously it says something about the idea. It’s the right way to do it, if you’re really going to be serious about country codes. Okay, so are there any restrictions on .cl in terms of who is allowed to register them? Patricio P: Not anymore. We used to have one restriction that said you had to have a tax id number for Chile, we don’t require that anymore. When that was in place, what that meant is that people from abroad, they had to find a local point of contact that will kind of lend their tax id number, which well, a few years ago we decided to eliminate that requirement, so nowadays you can register your .cl from anywhere in the world. You can be a natural person or company, whatever. Joe A: Okay. So even if somebody in the United States or Europe wants register to .cl there is no blocking them based on their? Patricio P: No problem at all. Joe A: Okay. How about in terms of intellectual property? So, do you guys have in Latin America a similar organization to the World Intellectual Property Organization or do you use that WIPO itself? Patricio P: We do not use it. We believe that the first country, the first TLD in the world to use a resolution system, concrete resolution system based on arbitration. We started it in 1997, two years before the UDRP was introduced. Patricio P: And actually UDRP was approved at the ICANN meeting that was held in Santiago in 1999. Joe A: Oh no kidding? Wow. You guys are ahead of the curve here. Patricio P: Yeah, we started in 1997 because we realized that a system was needed to decide when there was a conflict, and it needed to be fast and low cost and the Chilean judicial system is neither of that. Joe A: It’s common everywhere, yeah. Patricio P: So, we chose a system of arbitration and we’ve been using that ever since, so it’s a local dispute resolution system. It’s not UDRP, it’s an LDRP. Patricio P: We have a number of arbitrators that are independent from Chile, so we just managed the system, but the arbitrators themselves are independent. Joe A: Do they do work for other Latin American countries as well or is it just for? Patricio P: They work for us, but quite a few of them are also panelists for the UDRP with WIPO. Patricio P: So that has been working pretty well and that has been, has become part of the way the system works in Chile. The local intellectual property community and the community in general know that’s the way you solve this kind of disputes in Chile. Joe A: Right, okay. And I imagine. Patricio P: Also, it’s been a system that works completely online, which for a country like Chile with a very conservative judicial tradition, it’s quite an innovation that you can do everything through the web. And by the way, there’s one thing else. The UDRP system WIPO, those are arbitration panels, but they do not have the force of law, while in Chile an arbitrator it’s actually a judge. Joe A: Oh really? So, they do this on the side? Patricio P: The rulings have the force of law and they are under the supervision of the appeals court, so they are very much part of the judicial system, even though they are arbitrators and those are not trials. Joe A: Right, it’s not the same kind cost-structure as well, I imagine. Patricio P: Yup, that’s right. Joe A: Wow that was really good. And what about if somebody from out of Chile, like let’s say somebody from the United States makes a claim to about a .cl domain, do they still use that same process or they still use the Chilean Arbitration System or would they? Patricio P: They would have to use the Chilean Arbitration System and that’s one of the reasons why we moved to a fully online system, to make it possible for you to participate from anywhere in the world. Joe A: Yeah, and I imagine that it does a lot to reduce costs as well because it shortens the time and it just makes it a lot easier for people to process, right? Patricio P: Exactly. And there’s a very well defined flow of events that happened during the process. Joe A: Wow. Okay, let’s go to another idea. What about technology? So, obviously it sounds like you guys really go way back, so I’m sure you’re doing something very amazing down there, but do you have a self-developed registry system? Do you use something out of another one or I’m just curious of what you do there? Patricio P: We use a system that was developed in house. The system replaced our very old system that we started developing and using in the early days. Patricio P: The current system implements EPP, so we’re fully ready to work with the registrars. Patricio P: Until a few years ago, we did everything ourselves, the only place where you could go and buy a .cl domain was with us, NIC Chile. Joe A: Oh I see, okay. Patricio P: Now, we keep doing that, but you can also go to a number of registrars that can sell you a .cl and they communicate with our registrar system by EPP. Joe A: Do you have registrars that are directly accredited only within Chile or do you accredit registrars in other nations? Patricio P: So far we are using mostly international registrars, and we are trying to develop, help companies become registrars in Chile, from Chile, but that’s just starting, so what we have done so far, what’s actually working is that the registrars that are registered accredited with ICANN, if they are accredited with ICANN they can immediately become accredited with us without any additional requirements. Joe A: Right and that makes a lot of sense since they have already gone through the rigors of becoming accredited and now that you’re doing EPP, it all seems it will go together very well, wouldn’t it? Patricio P: Yeah, that’s what we do. Joe A: Yeah. Okay. How about in terms of, many of the country codes are signing their zones or using DNS sec now, have you made that move as well? Patricio P: Oh yeah. The .cl zone has been signed for a few years already and so we have made that available to our customers. Patricio P: A few of them have their zones signed. Joe A: It takes time. Patricio P: The adoption of DNS sec in Chile hasn’t gone very much further than the zone itself, but cl zone is definitely being signed. Joe A: The truth is I think that’s a problem that all not only country codes face, but even .com or .org, I mean they are signed but it seems the end user adoption is quite slow all over the world, so it’s just going to take some time I suppose. Are you doing anything in terms of trying to encourage them or marketing in terms of making them realize the value that they can get from that too? Patricio P: We have a number of seminars for them, and we are trying to work with communities that may benefit from signing their zones, but it’s very slow and they don’t immediately see the value of that. Patricio P: The banks for instance. We are trying to work with the bank association. Patricio P: But as I’ve said it’s slow, they have to see what value, they don’t even see the value, but we have to work hard to help them understand it. Joe A: One of the new top level domains the .banks since you bring up banking has actually instituted all these rules. Now, these guys are selling their domain for a pretty high number, but in the US it seems that many of the banks have taken advantage of it and they are actually requiring them to sign the zone, they are requiring them to use DMARK for email and all the standards are like kind of forced upon them if they want to use a domain, but you can’t do that just with a standard country code or a generic domain, I don’t think, but it’s interesting to see. I suppose with all the news about security being a problem and all these big companies that are being taken advantage of through a lack of security, I think that it’s just going to take some time, but as people see that they’ll hopefully become more active, I would think. Joe A: All right, so I guess one of the other things I wanted to ask you about marketing. Do you actually have people within .cl that their job is marketing or how do you guys go about that? Patricio P: Well, Margarita is in-charge of marketing; do you know Margarita of marketing? Joe A: Yes, I do. Patricio P: In that area, we do have some marketing. Basically its ping at generating more name recognition or brand recognition for NIC Chile that people would know where to go to register a domain or what the domain is good for. It’s not like trying to convince them to go us instead of the competition, but it’s just so that they would know why should they register their domain and where they should go, and we do that through various channels, we have some presence in the Metro system, when you ride the Metro in Santiago, you’ll see some large panels with our advertisement. Patricio P: We have ads in some of the most popular radio shows, especially those people listen to when they are driving to and from work. Patricio P: Caught in a traffic jam. Patricio P: And also we sponsor many events in the community. Actually a lot of them, we give them some money, we help them with some of their expenses, and so we have a presence in events related to the internet, but also related to technology in general. Patricio P: And we have also have been supporting a number of events that are trying to increase the participation of women in technology. Patricio P: So that all helps us get visibility for our name and for our logo, and sometimes, a colleague once was telling that are ads were everywhere, and I said what do you mean by everywhere? You are in the Metro, you are in the radio. And I said we’re only in the Metro and in the radio. Joe A: Well, they must ride the Metro quite a bit I guess. So, that’s good. Well, it certainly is a sensible way to do it. I mean and by the way because you got that early start, you also get the added benefit of larger companies advertising their business with .cl on the end. That’s kind of a secret hidden value that you get. Patricio P: Exactly, exactly, that’s a free advertisement for us. Joe A: Right and that’s because you were early to the game. What about in terms of, I guess I want to ask, one of the problems I see in some of the countries where I have done these interviews is let’s call it the penetration rate of internet access. Is it really strong in Chile, and also do they access the internet more through mobile phone or through regular desktop computing? Patricio P: Off the top of my head, I don’t have the figures and the numbers, but it’s very high and nowadays it’s mostly mobile. Almost everyone has a smart phone in Chile, and through their smart phones they access the internet. Before that it used to be also very high relatively speaking when people used mostly desktops and laptops, but it’s been shifting to mobile very fast. Joe A: And I guess you have the advantage of being on the coast and with the long coast that you have there, it’s probably easy to bring in cable and international internet access and get everything really well connected, wasn’t it. Patricio P: Yeah, but we were also very far from everywhere, so. Joe A: Well, that’s true. Patricio P: It took a long time for fiber, for the undersea cable to arrive, but nowadays we have it, and the country is now trying to reach the southernmost tip of the country with fiber, which is still not there. Joe A: Well, it’s like any country even the United States doesn’t have really fast or broadband access to every part. The remote areas are always very difficult I would think, and I’m sure you have the same situation down there. Do you find it that a lot of people are registering domain names in terms of the sectors of the market in Chile, are they more for personal, more for business? Are people running blogs like they do here in terms of just their interest and hobby’s and things like that or mostly just business? Patricio P: Well, I think the answer is yes to all of them. Joe A: It is, ha? Patricio P: Yeah, our customers are about half natural person, about half businesses or corporations. But we believe that the fraction of business is a bit higher, because a number of the domains registered by persons are probably startups. People that are trying to launch some small business and they are still doing it in their own name without incorporating as a company, they’ll probably do it later if they succeed. Patricio P: A number of persons probably are also trying to do some kind of business on the internet. Joe A: Yeah, we find that many of the new registrations comes from startups here as well, so I think that makes a lot of sense to target them, and I’m always trying to think about where the next million registration is going to come from and I do think that startups are a big part of that. Patricio P: A large fraction of the small and medium enterprises in Chile are still not on board, so that’s one place where it could come. I’m not sure that it will, but that’s one possibility. Joe A: Yeah. Well, I mentioned this in the previous interview, but I’ve always kind of joke about how the yellow pages have disappeared at least in the United States, and so even restaurants and small stores, clothing stores, that haven’t gone online, it’s really important for them to somehow get online. What would you say is the most predominant just speaking about Chile in general, market, where is most of the business done online? Like of course we’ve got Amazon here, I think I’ve heard in South America that there are a few places where most people gather to buy things. Is there something like that in Chile that’s especially predominant? Patricio P: Well, Amazon isn’t yet here locally. Patricio P: Of course I’m working to buy from Amazon or Alibaba. Patricio P: But locally I think some of the large department stores that have opened up there online channels for selling. Joe A: Really? Okay, that’s interesting. So a lot of the bigger stores are doing it online then? Patricio P: Now, compared to how Amazon does it, they are still, they have a lot of homework to do to be really efficient especially in the legality of the goods. Joe A: Right, that’s probably always the biggest challenge in retail. So, what would you say are the most important goals for .cl moving forward now? Patricio P: Well, we have to keep working to make our user experience better. Our system is now due for a total review and some revamping. We also need to work more on providing additional services besides just domain name registration. Our traditional view was that our business was to sell domain names and we didn’t want to interfere in other people doing the rest of the work, like providing hosting for the domain name resolution or website hosting or what not. Patricio P: And that’s the way it’s developed all these years, but nowadays that all of the markets are much more mature we think we should go a little into that too. At least in providing DNS, domain name services for our customers. Patricio P: We’ve always done something in that line, which is providing secondary. We are I think one of the few registries where you can get secondary service for free just by clicking on that check box. Patricio P: We did that because in the early days it was hard for people to find where to host their primary domain name service and it was even harder to find additional ones like to secondary. So, we said, we’ll do it, don’t worry. Just check here and we’re the secondary for your domain. You just worry about getting a primary, and that is a service that we keep providing. But now we are planning on providing primary services for customers and also offering some of our domain name resolution infrastructure for companies that may want to use that where we have a network of servers that we manage with servers in Chile and abroad, and besides that we also hire services from third parties to increase our coverage, adding all that up we have over 100 domain names resolution servers around the world. Joe A: Wow! Yeah and that is certainly important for dependability, redundancy, everything, right? Joe A: Okay. Well, I think that’s about it. I don’t want to end this interview without mentioning however congratulating you on your recent award from ICANN, for your long-time service. I think they call it the Multi-Stakeholder Ethos Award. Patricio P: Exactly, exactly. I have to say to people what that means. Joe A: Well, why don’t explain that to me. I think I kind of have a feel, but I’d like to ask you. Patricio P: Well, if you are in the internet community you probably know what that is. But maybe my friends don’t have anything to do with the community, they say, congratulations on whatever prize you’ve got. Yeah, through the years the multi-stakeholders model has been taking fold and it’s the way we work in the community, giving the voice to everyone, everyone that wants to be involved can be involved, it’s not like you’re in a multilateral model where only governance have a say. Patricio P: Here everyone has a say, governance of course and that voice is very important, but also civil society and us in the technical community, the IT community, everyone, so that’s the multi-stakeholder model, and probably because of having been involved in build process for so long, my colleagues kindly thought that I deserve this recognition which is something I’m very grateful for. Joe A: Yeah. You know I’ve been out of the ICANN world because for the last 4 years, I’ve been focused on the retail registrar over working at 101 domain, and I was going out to customers and end users and not attending ICANN meetings, but prior to that I probably attended 20 ICANN meetings when I worked for a different registry and I remember you. I wasn’t always involved in all of the policy meetings and things like that, but I would watch and I do remember you always being there and always being involved, so I think that this is a well-deserved award and I do want to congratulate you for that. Joe A: You’re welcome. Is there anything else that you would like to share in this interview before we call an end to it? Is there anything on your mind that I might not have talked about? Patricio P: I think we’ve covered more or less everything. Patricio P: So yes, thank you for the opportunity to speak with you. Joe A: Well, thank you very much for taking the time. I’m talking to Patricio P Poblete, and he manages the .cl registry and we want to thank him for coming onto CountryCodePeople.info and we wish you the best as you move forward. We’ll see you at the next ICANN meeting. Patricio P: Thank you very much. See you. Joe: The first thing I would like to do is to introduce Abibu. I met Abibu at – well, I may have met you at the ICANN meeting in Johannesburg or was it first time in the Africa DNS forum? I’m trying to remember. Abibu: I think it was in Johannesburg. Abibu: The first time we met. Joe: I was fortunate enough to go to Dar es Salaam. In fact, I got a chance to go a little bit for a day or two to Zanzibar which was a wonderful place to visit. I got a spice tour and spent some time right on the sea there. A beautiful country. The little bit I know about Tanzania is it’s a country where they have the Kilimanjaro National Park which is beautiful. I wish I would have been able to spend a little bit more time there. Joe: Yeah, yeah. It’s also – I know that Tanzania has the big five – the elephant, the lion, the leopard, the buffalo, the rhino. Joe: Just an amazing place and I got to spend almost a week there with many of the Country Code operators. And one of them that I met, I had the sense was a leader and somebody who knows a lot of people from all over Africa, was Abibu. And how do you pronounce your last name? I want to make sure I say it right, Abibu. Abibu: My last name is Ntahigiye. The way it’s just written. Joe: So he runs the .tz country code. To me, that’s a very interesting one. Tanzania was a beautiful country. It looks like it’s a country that holds a lot of promise. So I just want to ask you a few questions about how you got involved with .tz and also a little bit about yourself and then about the actual ccTLD. Kind of give me a little bit of your own history, Abibu. How did you become involved in the domain industry and especially with .tz? Abibu: Basically, I’m the graduate from the University of Dar es Salaam. I did an engineering course in electrical and telecommunication. After graduation, I joined an airline telecommunication company called Sita, S-I-T-A. Abibu: And I worked there for 11.5 years before joining tzNIC. Abibu: And I was the first recruit of tzNIC. Abibu: Yes. So I joined in 2008. And by then, tzNIC had just been registered. It was registered way back in 2006 in November. Abibu: So, once they were done, I was the first recruit in March 2008 as the first manager of tzNIC. Abibu: Thereafter, other staff were recruited and currently we have seven staff members. Joe: Wow. – oh, so you have seven people on staff right now? Joe: Okay. That’s interesting. So how many – if I may ask, how many domains on your management are there on the tzNIC registry now? Abibu: Currently, we have more than 14,000 domains. It’s a small registry, but we hope with a population of more than 50 million people, with the time, maybe it’s going to grow like other countries. Joe: That would be very exciting. Joe: You know, I had a sense when I came to visit Dar es Salaam which is – is that the biggest city there? Abibu: Yeah, it is. But we have other relatively big but not like Dar es Salaa. In terms of population, I’m saying, not in terms of area coverage. Abibu: But we have other cities. We have Kilimanjaro region as well where Kilimanjaro Mountain is. We have Arusha. Arusha, where you have this Ngorongoro Crater, et cetera. Abibu: So there are other regions which are beautiful as well, not in terms of population. Joe: Yeah. I had a sense that it had a pretty fast-growing business community. And I suppose that that’s important for domain names because, obviously, the more people that are running businesses, the more businesses want to share information and sell products. So it seemed to me that it was pretty big in terms of the business community and growing pretty fast. Abibu: Very true. And I think it is the case with the most countries in Africa whereby you find these capital cities or business cities, you have even more registrars compared to other regions outside of these business cities. Joe: Yeah. So how is the growth? I mean, I’m curious of your experience there. Okay, so you say you have about 14,000 domains under management. Joe: What are some of the challenges that you have faced and maybe overcome, and some of the challenges that you still are working on today? Abibu: Basically, there is a challenge on awareness on the values, especially on the competition with the generic domain names. The .coms are very popular. Abibu: And most people think that they are international. But we are telling them that had we started at par with the .com, maybe the country codes would be leading, but it’s not the case. So it will take time for the awareness. And, you know, awareness also needs funds, more funds to reach more people so that – and you need also to build the trust because it’s not the matter that use .tz, it’s the matter that .tz works. And the operation of .tz depends on many, many players. First of all, the registry and you have the registrars and the DNS operators. Abibu: So basically, the efforts we are making is the awareness about the values of ccTLD domains, .tz domain, but also making sure that this .tz domain, the web servers and main servers giving the services for .tz domain are operational. And in this regard, we have decided – I hope you know something called AfNOG, African Network Operators Group. Joe: I’ve seen their website. I donut know too much about them but I have familiarity. Abibu: It’s about building in Africa. So we have localized the effort so that we build the capacity of the local operators so that in the long run, we brand the .tz and people appreciate that .tz also works. Abibu: Yeah, We do a lot of advertisements through newspapers, through radio, through various media. Joe: – Are there many more .com domains or would you say there are more .tz in the country? Abibu: Well I can’t ascertain the number of .com domains or other generic key domains, but what I can say is that most of the common people use .com email accounts. Abibu: Whether you count the domain names and use of .com, there are two different aspects. Abibu: You might have yahoo.com users, gmail.com users but it’s a single domain, serving a number of people. So I can’t tell exactly the number of generic key domain names versus .tz domain names. Joe: Right, okay. Do you have restrictions on .tz in terms of who’s allowed to register it or are they available all over the world or you just offer them mostly to Tanzanian citizens? Abibu: Well, at the moment, I can say the restriction is there but the conditions are very minimal because we understand that .tz is for Tanzanian entities and Tanzanians as well but also we have other Tanzanians outside of the country. So we can’t close the door completely. So we insist that even if you are a foreigner, when you will register a domain name, we need at least a local contact. Abibu: Meaning that you can have two administrable contacts, you yourself and someone within the country. So that for the administration purposes, we donut incur any cost when there is any issues related to our domain. So I can say somehow it’s half open or half close. Joe: So you require a local contact but through a local contact, I guess somebody from out of the country can register domains? Abibu: Yeah, very true, very true. Joe: How about with accrediting registrar? Abibu: Registrars also require a local presence but if you follow the DNS forum, we were discussing this issue and basically and primarily opening up the accreditation outside of the country and had a proposal that at least we can start at the sub regional level like East Africa first, and see how far we can go. Once this is done within the sub region, then it easy to extend outside of the sub region, either to the continent or to the world at large. Joe: Right. Oh, that makes sense. So you – what is your – what is your primary website? Abibu: No, it is tznic.or.tz. Joe: .tz. Okay, I was curious of your own website. Abibu: Yeah. But we have – we have a special registration portal. Abibu: Yeah, we do. It’s called the Karibu. It means welcome. K-A-R-I-Bu. Joe: Oh, Karibu. Yeah. Okay, yeah, I can see – I see your tznic site now. Joe: I’m looking at that right now. Passionately Tanzanian, that’s really good. That’s a good saying. I like that. Joe: And then you have the Karibu one as well. Abibu: Yeah, have we registered it? Karibu.tz. Basically, it’s a list and now registrars with the registration particulars. Joe: I like your – I like your saying, “It’s my country and my domain.” That’s very nice. Joe: But it looks like you’re thinking about, you know, ways of helping people to remember the .tz. Joe: And that’s something that’s really important. Okay, very nice. So that’s another question. So are people able to register .tz at the second level or must they have something like .co or .or in front of it? Abibu: Yeah, currently, we have twelve categories of the second level and we have not opened up the second level. But we are thinking of opening after doing some research if we were to add value or not. Abibu: Yeah, it’s true. It’s true but also identification is key because having registration at the third level, it adds more identification that maybe you are a government entity or you are a corporate entity or something like that. So it’s a matter researching, not just changing the policy and we are looking for this learning from nominet – nominet went through the same process. Abibu: Where we are registering in the third level and they have moved to the second level. So we needed to learn from the challenges they got and then we can – we can decide to register on the second level. Joe: Now, that brings up an interesting question also related to that. Do you work with an intellectual property organization such as WIPO? Joe: Yeah, or any of those. Abibu: Yes. Yeah. Yeah, we do it with WIPO and this is since 2011, if I’m not mistaken. And the reason behind is that we donut have many experts in the continent supporting domain dispute issues. By the time I ask them, they had only one – one panelist from Uganda. Abibu: And so I thought we should start with WIPO, so we got into contract with them but we are promoting our local firms also to do arbitration of domain names. And currently, we have one legal company which can deal with the domain dispute resolution services. So we are building their local capacity also, so that registrants can have a choice, either to international dispute operator or to a local firm. Abibu: Right because we are not certain where the dispute will be coming from. Joe: Right. All right, tell me a little bit about technology. What do you guys – how do you guys – what kinds of technology are you using? Are you developing your own registry systems, do you use someone else’s? I’m just curious of how you do that nowadays. Abibu: Yeah, we are using someone else’s. Basically, we are using the open package from Czech Republic. Abibu: Yeah. It is called the FRED. Joe: Yeah, I have heard of it, yeah. Abibu: Yeah. We have adopted it and we are using it effectively. And it has even supported us to deploy DNSSEC. Joe: Has that already been done or is it something you’re planning now? Abibu: No, we are the third country in Africa to deploy DNSSEC. We deployed in 2012. Joe: I think that’s becoming more important today than ever before, considering all of the – you know, just so many – so much fraud and so many attacks. Abibu: And then basically, registrants are needed to be assured of the security issues. Joe: Yeah. I was actually going to ask you about DNSSEC. So you beat me to that one. That’s great. Joe: It’s a very important factor, I think. Abibu: Yeah. And the challenge we are having with the DNSSEC is taking down further to the registrars and the registrant. We have very domains signed because of the capacity of the registrars and DNS operators. But we are also building the capacity of our registrars so that they can complete the chain of trust. Joe: Right. I think that’s a matter of education. And you should know that even in the United States, the number of domains that are actually signed at the end user level is quite low. I mean, there’s a lot of room for improvement in there. But it starts with registries, doesn’t it? Abibu: Very true. And basically, the registry has to be in front, you donut have to lag behind. You donut have to be pushed by your customers to deploy something. So for .tz registry, we made sure that we are IPV6 ready and also ready for DNSSEC deployment. Joe: – so what – you know, I always like to bring up – you mentioned that you are starting to do some business out of Tanzania. How do you feel about what they call domain hacks? Now, I’m thinking with .tz, I mean, there’s possibilities for things it could mean. There’s a lot of words in the English language that end with .tz. But, you know, I mean, just playing around with some ideas, you know, there might be people that would think – I donut know, it’s a really tough one, maybe time zone, twilight zone, training zone or test zone. Well, are you getting people that are registering .tz with English words or as anything other than that meaning, Tanzania? Abibu: So far, I haven’t such experience. But I remember the first time I visited Geneva for the – a certain exhibition, I heard of a city in Germany ending with T-Z. It’s called Metz – something like Metz. Joe: Oh, right. That’s right. Abibu: I haven’t seen such registration but – because we have the second level of .ne.tz, I was expecting maybe more registration from Germany in that city called the Metz. Abibu: But I donut have any experience with these English words, just like maybe for the case of Nigeria with NG. Joe: Do you guys – would you say more of your sales come from your direct channel or do more of your sales come from registrars? Joe: Do more of your sales come through a direct channel, meaning they register directly through the Tanzanian registry, or do more of your sales come through registrars? Abibu: We have adopted the three-R model and very few are within our account. Initially, we are the first registrar before accrediting the registrars. And when we took over, there were some domains already registered in the past. Abibu: So there are some domains already registered on our account but most of the registration now are done by the registrars. Joe: Okay. So, yeah, I mean this is always a big question. Registrars, you know, want to always make sure that they have an equal opportunity to compete. Joe: So, how many registrars do you guys have nowadays? Abibu: We have more than 50 registrars at the moment. Abibu: Yeah. Close to 60 or 65, I’m not very sure of the exact number. Joe: Okay. Yeah, that’s excellent. Abibu: But for us, it’s not the issue of a big number. We need performing registrars. So even if we have 10 registrars who are performing, it could be better than 100 registrars, 90 of them non-performing. Abibu: Yeah, yeah. The key issue is performance, not the big number of them. Joe: Okay. So what are some of the strategic goals that you have for your registry in order to continue to grow? Abibu: Our concern basically is on publicity and awareness so that most Tanzanians, when it comes to domain names, then the .tz should be the first choice. That is key because even our sustainability depends on the domain volume. We are trying to have the domain fee to be competitive with the .com. So basically, we rely fully on domain volume to be sustainable. But at the moment, we are supported by the regulator in terms of funding. But in the long run, we need to be independent. So, basically, the key strategy is on increasing the number of registrations. Abibu: No. It’s not for profit. Abibu: It’s not for profit and it’s a member-based company. Abibu: And it includes the public and private. It’s a PPP. Joe: How many domain names do you think you’d have to have to be able to turn a profit? Abibu: We need not less than 50,000 domains. Joe: – a local domain rather than .com. So that makes a lot of sense. Okay. What about market segments? So, you know, would you say registrations in .tz come more from business community, from personal end users, from educational? I mean, I’m curious of what kinds of market segments you guys have. Abibu: Basically, it’s from commercial. Abibu: Yeah. Even at the moment, the big volume of domains are under .co.tz. Joe: Really? Have you made any efforts to get like, for example, somebody mentioned at the DNS forum, to try to get your biggest companies within the country to use it, the airline, obviously government – have you guys made any efforts to get some of the larger Tanzanian companies to use .tz or maybe they are already? Abibu: Yeah, I remember most of the telco companies, they are using .co.tz and one of them is Vodacom. They are using the Vodacom.co.tz and since they are managing their own DNS, they donut have any complaints regarding the .tz registry. Abibu: Yes, they donut use any other domain apart from vodacom.co.tz. Joe: Oh, that’s excellent. So I bet – you know, that’s an excellent thing to have. Abibu: Yeah. Basically, I was looking forward for them to be like a accredited registrars of .tz. Probably it would have been a good idea. Abibu: Yeah, because they can provide the reliable DNS services to the registrants. Joe: Right. No response yet or ? Abibu: Well, approaching them is difficult, you need some people to convince them some stuff who can approach the top management and convince them about their business lines. You know, it’s like a normal registrar can perform more than an ISP because an ISP thing that maybe domain registration business is not a cash cow business line. Abibu: So to convince them you need some effort. Abibu: So even for the telco companies, they might think maybe domain business is not an issue – that is not a business line that can become a cash cow. Joe: Interesting. Yeah, how do – you know, people – a lot of businesses if I go back five years in the United States, used to advertise in yellow pages. Nowadays, the yellow pages have gone from being this thick to being like that thick. Is that happening – is that happening in Tanzania as well? Abibu: Well, I haven’t looked at the yellow pages for some time now. But I remember I made some advert through the yellow pages sometime but about four or five years ago. Abibu: But I donut know how big it is at the moment but, well, I think it’s online as well. Joe: Yeah, I think more people are just finding information online and that has made it a lot less useful to kill all the trees. Abibu: – but not – you donut have many institutions or individuals requesting for landlines so this address book for the landline numbers should not expect to grow. Abibu: Almost all the people are using cellular phones. Joe: Even here we have a trend where people are turning off their home phones and just using their cellphones. Joe: That brings up one other issue I wanted to ask you about. In terms of the access to the Internet, is – do you have any data as to how many people access the Internet via mobile phones in Tanzania versus desktops? Abibu: I donut have the exact number but for sure that number has grown. Abibu: I donut have statistics. Maybe from the regulators webpage, it can be obtained but I’m not very sure of the current figure because the mobile phone services has grown up to remote areas. Abibu: So people can access Internet over there using the mobile phone. They can also send money through mobile phone so basically mobile phone has been a very, very useful platform. Abibu: Currently – the only option for myself to send to my grandfather or my father in remote areas is through mobile phone and mobile phones are – most people can achieve buying the mobile phone for their relatives. Joe: What is the payment technology that you’re using there in Tanzania? Is it the same like Kenya’s? I know they have, what, M-Pesa. Abibu: Yeah, we have the same. We have M-Pesa through Vodacom. We have Tigo Pesa through call… a company called Tigo. We have Airtel Money through Airtel. And there is a new company called the Halotel. They have HALOPESA. So most the options are coming through all the mobile phones in operation. Abibu: Very true. And even at the moment, you can send money across various network like the Tigo Pesa, M-Pesa and Airtel Money. You can send across those different networks. Joe: Wow, that sounds really good. I’m glad to see that because I think that’s one of the keys to unlocking the value of the Internet within each of the countries in Africa. Joe: Okay. All right. Well, listen, do you have anything else that you want to share while we’re on the interview? Abibu: The challenges in terms of marketing, you know, these services are very technical so even marketing it is challenging. Abibu: And from participation in various DNS forum, I have attendant all of them. And for the time being at least a way on which are the best marketing options. In the past, people are thinking that if you give a domain for free then you’re going to have more registrations but in the end we end up with more deletions especially to people who are knowledgeable to domain, they will register them for free with a hope that they’re going to sell them. So there is a lot of experience in regarding marketing and we hope maybe will the time when the communities’ knowledge upon the opportunities then more domains will be coming. Abibu: But I can see a lot of challenges to people who are not used having their brands or domains now maybe they might be taken by some other people and this has been my message whenever I meet a certain community or when I attend some annual general meeting or some groups. Yeah, but in the mentality that the .coms and have domains that are international is still in our people’s minds and this will change with the time. Abibu: Thank you so much. Thank you so much. Joe: – domains. All right, thank you very much. And thank you for coming out to coutrycodepeople.info. Joe: All right. Bye-bye for now. Abibu: I’ll see you next time. I didn’t know that my cousin, Kristy Alagna, wrote a book! I’m so excited for her and have already ordered one. This is a part of my family’s history and we do have some fun and crazy stories and memories as kids growing up in a Sicilian family during the seventies, in the Chicago area. I can’t wait to get the book. Our family is all dispersed throughout the country now. But when we had our family reunion two months ago, it was like we never left my cousin’s basement. This was a place we visited as often as possible as kids. But what stands out is that each year, we gathered on New Years eve, almost every year for as long as I can remember. And our parents played cards, shouted and laughed all night… and my uncle blinded us with movie camera lights, and we pounded pots and pans at midnight, and we all fell asleep on some floor in some bedroom throughout their home, and we had breakfast and dinner the next day with pasta and every kind of strange fish or cephalopod squirming around in sinks (which most of us kids didn’t really like – at least I didn’t). It went on and on. And, as kids we usually fought with our parents to go and hang out with our friends instead on New Years Eve, and they mostly did not let us, which was great, because we ended up having so much fun with our cousins and we bonded so closely with them. Sorry for the strange, run-on sentences above, but that’s how I remember it and that is why, when we all got together a few months ago in Chicago, it was like we never left my cousin’s basement. That is something that will never change for any of us. It’s the coolest thing. I can’t believe I didn’t already post this picture! Anyway, seeing Kristy’s video and hearing about her book, I could not help but to write this post and let you know about her book. The way she reads just a few lines makes me anxious to see the rest. She’s awesome! I know I use this blog mostly to write about business stuff. This is something really close to my heart; one of my beautiful cuz’s (I have a lot of them :-). So check out her video below. I know you’ll be touched. And then visit her website and get her book, “Suitable for Framing”. I’m sure you’ll love it.